Double-Acting for all of your baking needs. 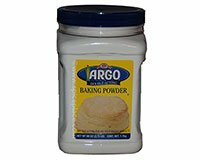 Argo double-acting baking powder is a leavening agent used to make many baked products. Contains about 2,835 1/8 tsp portions. Ingredients: Sodium Acid Pyrophosphate, Sodium Bicarbonate, Corn Starch and Monocalcium Phosphate.